﻿ Hotel Azur Reims. JIMAT di Agoda.com! Terletak di pusat bandar Reims, Hotel Azur hanya 5 minit berjalan kaki dari stesen keretapi SNCF. Ia menawarkan bilik-bilik dengan TV satelit skrin rata dan akses internet Wi-Fi percuma. Sarapan pagi disediakan setiap hari di Azur dan ketika musim panas, tetamu boleh menikmati hidangan mereka di atas teres taman. Hotel Azur hanyalah 700 meter dari Cathedral Notre-Dame de Reims dan Museum of Fine Arts. Hotel ini mudah diakses dengan lebuh raya A4, yang menyediakan akses ke Paris. This is a nice little hotel, but don't get the impression that it's a "boutique" hotel. I saw a lot of reviews saying the staff spoke English. Not so. The "staff" during our stay was one woman, who didn't speak English. Luckily, our bad French got us through. There is a nice lady who serves breakfast and does speak English, but she doesn't seem to be part of the regular staff. We were led to believe that there was parking available. There is, but it's a few blocks away in a gated parking garage. It's not on the premises. The front desk/reception is only open from 7:00 AM to 8:00 PM. Any other time, you need a code to get into the hotel. Of course, we forgot the code one night and had to bang on the front door until the (seemingly only) employee working at Hotel Azur came down to let us in. Our room - two twin beds - was very small. No light in the hallways unless you turn it on yourself. I don't think I would stay here again if I was visiting Reims. staff could not have been more welcoming and treated us as family rather than guests. They gave us a great restaurant recommendation and a voucher for free champaign. 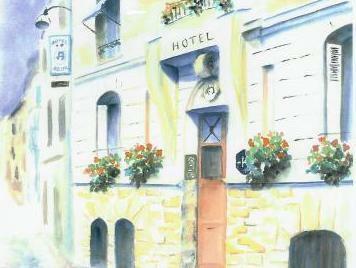 The rooms were all you would expect from a two star hotel but exceptionally well presented. The hotel is a short walk to all the sights and lots of bars and restaurants. No parking at the hotel but they have garages close by. Breakfast is traditional French but unusually these days served to you at your table. Free wi-fi is available throughout the hotel. Excellent for a one or two night stop.